Award-winning company Scamp Theatre will bring several of Julia Donaldson and Axel Scheffler’s best-loved children’s books to the London stage in 2015, including the world stage premiere of their most recent book The Scarecrows’ Wedding. Tiddler and other Terrific Tales will also play a Summer Season at Leicester Square Theatre. After runs at Edinburgh Fringe Festival and touring the UK, Tiddler and Other Terrific Tales will have its first West End season at Leicester Square Theatre from Saturday 11 July to Monday 31 August 2015, with press performances on Sunday 12 July 12.15pm and Tuesday 14 July 11.00am. 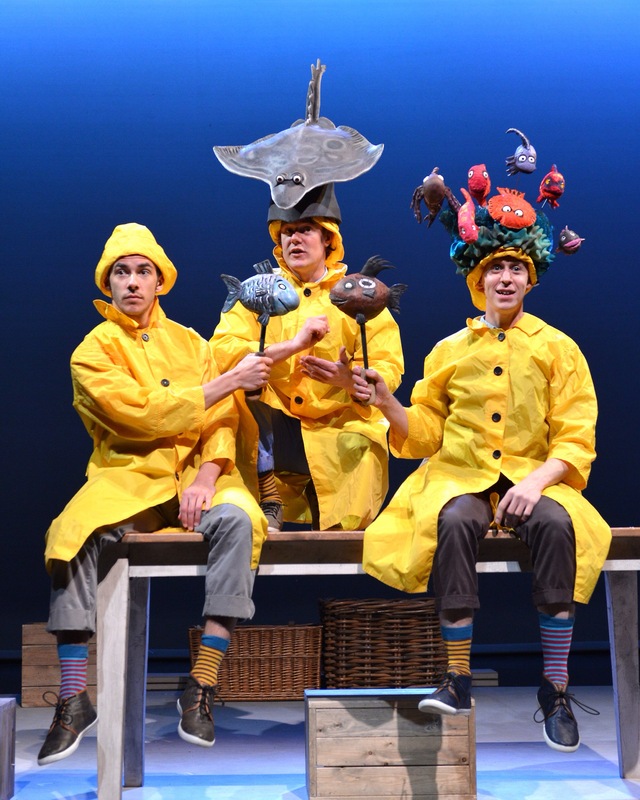 Tiddler and other Terrific Tales weaves together live music, puppetry and a whole host of colourful characters from some of the best-loved titles by Julia Donaldson including Tiddler, Monkey Puzzle, The Smartest Giant in Town and A Squash and a Squeeze. Funky moves, toe tapping tunes and giggles are guaranteed as audiences are taken under the sea, out on the farm and into the jungle! Tiddler and other Terrific Tales is the perfect treat for children of 3+ and their families and friends. Tiddler and other Terrific Tales is delightfully directed by Sally Cookson with dazzling design by Katie Sykes, funky tunes by Benji Bower and lush lighting by Elanor Higgins. It is performed by Joseph Carey, Peta Maurice and Darren Seed. Scamp Theatre are proud to present their latest production, a truly heart-warming adaptation of The Scarecrows’ Wedding, premiering at the Edinburgh Fringe Festival before touring the UK and playing London dates at Watford Palace Theatre, Redbridge Drama Centre, Greenwich Theatre and ArtsDepot. Betty O’Barley and Harry O’Hay are excellent scarecrows (they scare a lot of crows). Harry loves Betty, and Betty loves Harry – so they decide to get married. Harry sets off to search for their wedding day essentials including a dress of feathers, a bunch of flowers and a necklace made from shells. Bursting at the seams with Scamp Theatre’s inimitable style, this epic love story promises wit, drama, and wedding bells! The Scarecrows’ Wedding is directed by Eva Sampson, with design by James Button, lighting by Elanor Higgins and music by Darren Clark. The Scarecrows’ Wedding is produced by Scamp Theatre in association with Watford Palace Theatre. Julia Donaldson is a British writer, playwright and performer, the 2011–2013 Children’s Laureate and the prize-winning author of some of the world’s most-loved children’s books, most notably the modern classic The Gruffalo which has sold over 5 million copies worldwide. Julia is best known for her popular rhyming stories for children, especially those illustrated by Axel Scheffler, which include The Scarecrows Wedding, The Gruffalo, Room on the Broom, Stick Man and Tiddler and other Terrific Tales. Their books have sold millions of copies and have been translated into 40 languages. Julia also received an MBE in 2011 for her services to Literature. Julia divides her time between Scotland and West Sussex where she lives with her husband, Malcolm. Scamp Theatre was founded in 2003 by award-winning international producers Jennifer Sutherland and Louise Callow. Scamp bring a range of theatrical live performance to audiences of all ages, with an increased focus on adaptation, particularly in children’s literature. Scamp believe in creating playful and innovative theatrical experiences that not only startle and entertain but also encourage children and young people to use their imaginations. With productions touring constantly, Scamp have a superb track record in theatre production in London, on tour and at the world’s leading venues and festivals.